If heaven was a buffet with only delicious gourmet food and huge portions along with colorful people serving, that heaven would be Chicago. During my many visits to Chicago, I have learned to never eat at a restaurant or eatery that I could eat at home. The reason is, there are so many great places to eat. So if I eat something I could have eaten at home……. why eat at all. I love to experience new foods. My eating habits and adventurist nature in regards to food is definitely thanks to my parents. If you are not trying new foods and tasting new cultures, you are missing the boat and need to free your mind. Try it, you may like it. However, if you don’t like it, jump off the boat and swim to shore. Our first night in the “Windy City”, we went to a very well-known restaurant. My wife and I absolutely love this eatery and stop here during every visit to Chicago. This visit however was a bit less than average. First off, on the way to our booth I slipped on the tile floor three times because of the grease. Second, our booth was extremely dirty. I remarked to my wife that we could probably eat and be satisfied if we only ate the food from underneath our table. The bright spot in our visit was the great customer service given by the server. He was very attentive to our needs. When we mentioned the smorgasbord under the booth, he very quickly summoned someone to clean it up. He also made great suggestions on appetizers. He was very professional. There were 8 in our party and he remembered all of our orders even though we made it very difficult as we were tired from travel and very hungry. The next days plan was to eat good at “The Taste”. Therefore, we made no plans to eat at any specific eatery. 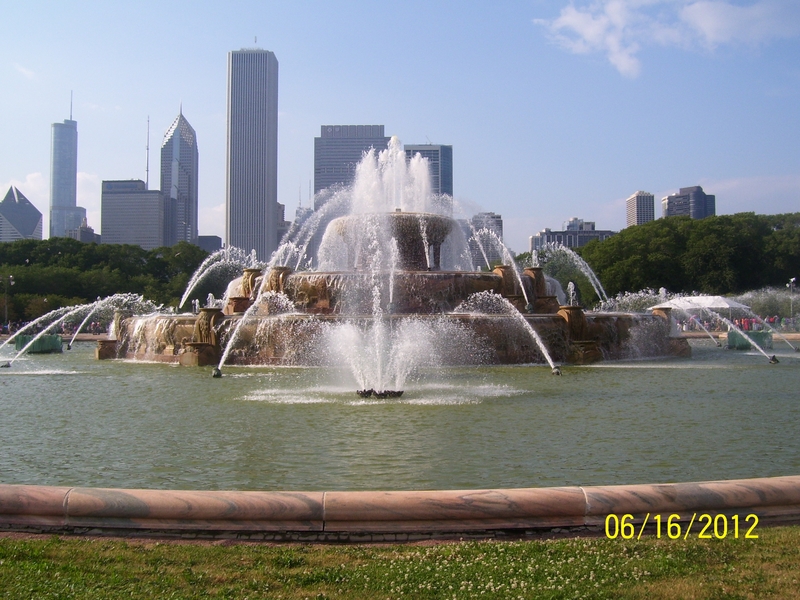 We made our way to Grant Park to stuff our gullet with the food goodness of some of the most tasty, exotic, and decadent cuisine Chicagoland offers. But guess what? It was raining. So after we got off the train we ducked into a restaurant to get a small appetizer. It was just about lunch time so the restaurant was packed. We were seated quite quickly even though we had a large party. We were given water and menus almost immediately. Here comes the kicker. We sat for about 30 minutes before our waitress came to the table. By this time the rain was pretty much over and I was dining with among others 3 women. They were for sure ready to eat and very upset at the wait. Of course we gathered our party and left for “The Taste”. Maybe next time they will get a second opportunity at a first impression. Now “The Taste” will never disappoint. If you have never been, just look for the roasted corn on the cob (delicious). Also, you have to get some of the Chicago Style Pizza (upside down and unbelievable). One of my new favorites is the monster size Churro (Spanish doughnut). The Churro was so delicious, but probably 2000 calories alone. Totally worth it! While we were down there we also enjoyed some of the street performers. Style Pro Crew, a few contortionists, and one memorable girl with multiple hula hoops. On “The Taste” main stage Rapheal Saadiq opened up for Chaka Khan. Cool show! Overall, “The Taste of Chicago” didn’t disappoint. Make your reservations now for next year. On our last day, we went out for breakfast at a well-known nationwide breakfast restaurant. I won’t divulge their name but a hint for you, they serve pancakes (horrible hint…LOL). Once again 8 person party and a great server. The bright spot was that we really didn’t wait that long. As we were waiting a server from another section came over and started a conversation with the whole table. She was great at engaging the whole table in the conversation. We were all having this great conversation that it felt like no time before our food came out. These servers are working for small tips because the price range really dictates the tip. This is a lower end restaurant price wise. This was actually the best service we received during our trip. This goes to show, you can’t always judge a book by its cover. So the next time you are in Chicago, go all out and have some fun. Remember to seek out restaurants that you have never eaten in because if you can get the same food at home, maybe you should have stayed home.